I’m just back from the International Winter Meet at Glenmore Lodge. This superb biennial event consists of 40 guests from 20 different countries climbing with 40 Scottish-savvy British climbers all under the watchful eye of Becky McGovern and Nick Colton from the BMC. The weather was kind, which meant winter routes were climbed every day but one, and a superb selection of outings were completed from straightforward hill walks to new Grade IXs. It will take several posts to describe the highlights, but without doubt the outstanding ascent of the meet took place on Saturday January 28 when Nick Bullock, Guy Roberson and visiting US climber Bayard Russell made the second ascent of the legendary Guerdon Grooves on Slime Wall of Buachaille Etive Mor. Guerdon Grooves, which takes the daunting wall left of Raven’s Gully, was first climbed as a summer route in 1948 by John Cunningham and Bill Smith. 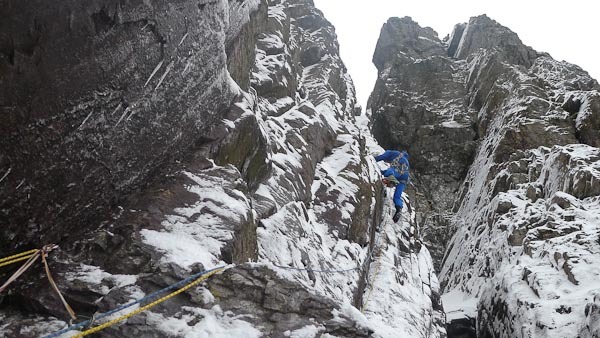 Graded HVS 5a, it has a reputation for poor protection, and its first winter ascent by Arthur Paul and Dave Cuthbertson in January 1984 was a clear step forward in Scottish winter climbing. Originally graded VI, it was the earliest route to be given Grade VIII (pre-dating Unicorn by a full year) when the grading system was made open-ended in the early 1990s, and the current guidebook grades it IX,8. Any attempt at a rating was pure speculation however, as the route had repulsed all repeat attempts and built up a huge reputation. This entry was posted in Repeats and tagged Bayard Russell, Buachaille Etive Mor, Guy Robertson, Nick Bullock. Bookmark the permalink. Nick you’re a star. What a fantastic effort. but it took three to tango on this one and as ever Robbo’s amazing knowledge of where to go when the time is right. I’m still unbelievably happy to have climbed this amazing route, and i will remember always the massive smiles as we topped out.